CONGRATULATIONS! You have successfully scanned the QR CODE to find the answer to your riddle! You can print your PRIZE here! Print one copy of the Halloween Patterning.pdf for each child. 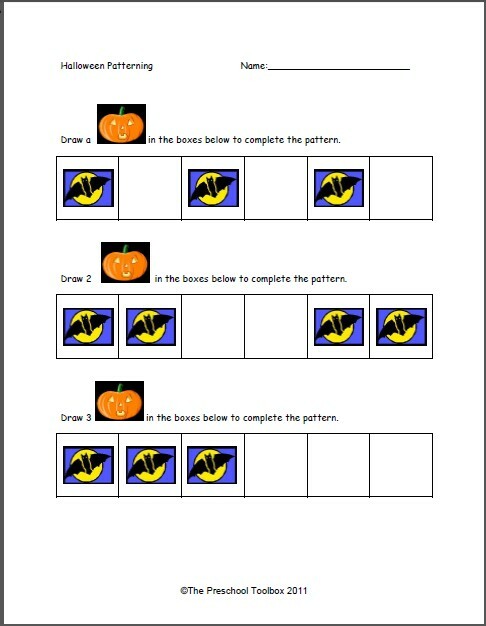 Read the patterning instructions for the children and have them draw jack-o-lanterns to complete the pattern strips. For younger children: Have the children draw circles for the jack-o-lantern or use pumpkin stickers. For older children: Have the children draw a jack-o-lantern with facial features in the pattern strip boxes. In conjunction with the QR Code Scavenger Hunt, The Preschool Toolbox Blog is offering a $50.00 Target Gift Card (retail value=$50.00). How to Enter: Please enter (beginning Monday, October, 15th) via the Rafflecopter form below. Giveaway Rules: Open to residents of the USA; must be age 18+ to enter. No participation is required to enter the giveaway. Winner will be announced on Halloween (31 October 2012). Thanks for entering and good luck! Winner will be selected through random.org and notified by email. Please note that the winner must respond within 48 hours of notification or an alternate winner will be randomly chosen. NO PURCHASE NECESSARY. VOID WHERE PROHIBITED BY LAW. We have received no monetary compensation in association with the QR Code Scavenger Hunt or Giveaway. All opinions are our own with the intent to raise awareness of the use of technology in early childhood. Using technology WISELY for structured learning through play will help parents and educators prepare children for TODAY and for the FUTURE! Thank you! Please leave a comment below if you and your child have enjoyed the QR Code Scavenger Hunt! We’d love to hear from YOU! My 3 year old loved scanning! Great game. Thanks!